Science has unequivocally confirmed it: a consistent daily meditation practice leads to better results for body, mind and soul. Meditation can lower your stress, enhance your can-do capacity, improve your sleep, make you mentally sharper, ease negative emotions and enhance positive ones… it can even optimize your work performance! So the question isn’t IF you should meditate, but rather HOW. There are so many choices when it comes to choosing a practice. How are you to know which is the best one for you? Good news! 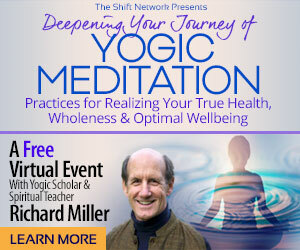 On Saturday, July 16, at 10:00am Pacific, yogic scholar and spiritual teacher Richard Miller will present a free online workshop, Deepening Your Journey of Yogic Meditation: Practices for Realizing Your True Health, Wholeness & Optimal Wellbeing. You don’t want to miss this opportunity for Richard to support you in fine-tuning your meditation practice based on the latest brain science as well as the instructions left to us by ancient seers. You can register for this FREE virtual workshop, here. This fascinating workshop will give you greater insight into yogic meditation traditions, which differ from the more well-known Buddhist traditions. For example, yogic meditation is particularly effective for accessing higher states of consciousness, including the joy and wellbeing that great yogis say is our birthright. It’s free to attend, but you must RSVP here. Please join us here for free! PS: Don’t miss your chance to experience Deepening Your Journey of Yogic Meditation: Practices for Realizing Your True Health, Wholeness & Optimal Wellbeing, where you’ll discover how to establish a far more effective and fulfilling practice of yogic meditation… for FREE!